Trigger Trainers is dedicated to personal protection and defensive firearms use. From this perspective, you should select the most powerful ammunition you can shoot comfortably, consistently and accurately. Remember these 3 words: COMFORTABLY, CONSISTENTLY, ACCURATELY. For this discussion, Comfortably means that you can shoot it all day, every day. You do not mind the recoil, noise, or flash. You do not flinch while firing, and you can place a second and third shot near the first in rapid succession. It does no good if you can't hit your target, again and again and again. To understand more about choosing your ammunition, you should understand what ammunition is and how it is used. The modern cartridge was revolutionary in its design, because before the cartridge, each component that makes up the cartridge (primer, charge and bullet) had to be individually put into the firearm through its muzzle and rammed into place. Click HERE for more information about the evolution of the cartridge and muzzle loading firearms. When most people talk about ammunition, they usually refer to bullets, however the bullet is only one part of the cartridge. Some people also refer to an individual cartridge as a 'round', as in 'rounds of ammunition'. In firearms, caliber or calibre is the approximate diameter of the bullet used, measured in inches or millimeters. When the barrel diameter is given in inches, the abbreviation "cal" is used in place of "inches." For example, a pistol with a diameter of 0.22 inch is a .22 cal; however, the decimal point is generally dropped when spoken, making it "twenty-two caliber" or a "two-two caliber". Similarly, a pistol with a diameter of 9 millimeters is a 9mm; generally referred to as a 9 mil. Click HERE for information about different types of ammunition. When we talk about how 'powerful' ammunition is, we are generally referring to its 'stopping power'. That is to say, how much force is contained in that bullet once it has been shot from the gun. It must be stressed that muzzle energy is dependent upon several factors and that even velocity is highly variable depending upon the length of the barrel a projectile is fired from. While the above list mentions some averages, there is wide variation in commercial ammunition. A 180 grain bullet fired from a .357 magnum handgun can achieve a muzzle energy of 580 foot-pounds. A 110 grain bullet fired from the same gun might only achieve 400 foot-pounds of muzzle energy, depending upon the manufacture of the cartridge. Some .45 Colt ammunition can produce 1,200 foot-pounds of muzzle energy, far in excess of the average listed above. 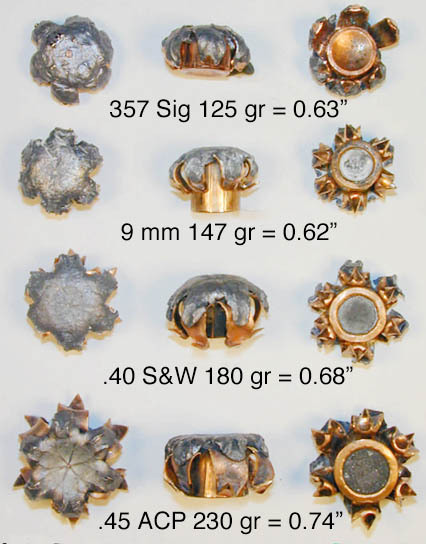 The 'typical' size ammunition for personal defense ranges from .380 at the low end, to .45 ACP at the high end. Some say that anything less than .38 is too small to have enough stopping power, and that a .45 ACP is too large for most people to use accurately. I believe that a person who is practiced and skilled in the use of their handgun can use just about any size gun and ammunition if it is right for them. Even a .22 'right between the eyes' at close range can be effective. However, the whole point is to find out what is right for YOU. For most people, particularly new shooters, the largest caliber they can comfortably and reliably shoot is a 9 mm Luger. Some people can comfortably shoot .45. Most police officers still carry 9mm handguns. With defense ammunition, 9mm is perfectly acceptable for defensive use. It is also very cheap to shoot, as ammunition is readily available everywhere. Another common defensive caliber is .40 S&W (Smith & Wesson). This is intermediate in recoil, power, and flash between a 9mm and .45 ACP. For those who can comfortably shoot the round in their gun, this is a better choice for defense. The ammunition is a bit more expensive than 9mm or even .45 ACP, which should be considered as well. Another common cartridge is the .357 Magnum. This cartridge started the "Magnum" era of handgun ammunition. This cartridge has sufficient energy to produce hydrostatic shock (remote wounding effects) in living targets, which significantly contributes to its positive reputation for stopping power. (Hydrostatic shock is the injury caused by the pressure wave resulting from the high-speed impact of the bullet.) Hydrostatic shock can produce remote wounding and incapacitating effects in living targets (in addition to the local tissue damage caused by the direct impact) through a hydraulic effect in liquid-filled tissues. There is also scientific evidence that hydrostatic shock can produce remote neural damage and cause incapacitation more quickly than blood loss effects. As such, the smaller .357 Magnum may be a better choice than the larger .45 ACP. 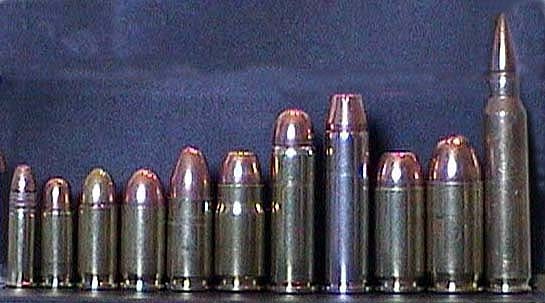 Hollow Point (JHP) ammunition of various calibers. smallest is 0.12", which is about an eighth (1/8) of an inch. However, the diameter is not the most important measurement. object that makes the biggest difference. 3 TIMES GREATER with the hollow point than the round nose. Regardless of the caliber, practice is vitally important for everyone with firearms. I stress again, the caliber that you should choose is the caliber that YOU can shoot COMFORTABLY, CONSISTENTLY & ACCURATELY is what is important. Defensive handgun use is about stopping the threat. Shoot to wound is a concept only used by cops on TV or Movies. Center mass is difficult enough to hit in a stress situation. You need to do what Law Enforcement does. Shoot to stop the threat. Shoot as many big bullets as necessary to stop the threat. If he dies, that's his problem. He should not have threatened you or your family in the first place. A recent deputy buddy of mine said: "Stopping the threat is between me and the bad guy. Whether he lives or dies is between him and his maker. Its not my responsibility." Since bigger bullets make bigger holes, larger calibers are better. But, only shots that hit the target count, which means that a miss is completely useless regardless of caliber. Larger handgun rounds are harder to accurately shoot, especially under stress. Therefore, choose the largest round that YOU (not someone you know) can shoot . . .
© Copyright 2001-2012 Steven K. Shapiro dba Trigger Trainers.